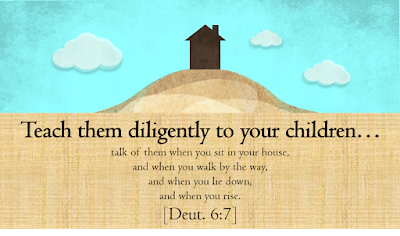 Deuteronomy 6:7 tells parents (and grandparents) that we should be diligently teaching our kids godly principles during four specific times of the day: “when you sit in your house, and when you walk by the way, and when you lie down, and when you rise.” Let’s talk about that first time: “When you sit in your house”. Don’t waste your evenings with your children watching TV or playing on cell phones all night. Be intentional with this time, because when they grow up and leave the house you can never have that time back. Here are some suggestions on how to not waste your evening. Spiritual routines. We all have evening routines. Maybe your family’s typical evening is supper, evening news, everyone goes their separate ways (video games, TV, homework, house cleaning), and finally bedtime. Why not throw a spiritual routine in the mix? If your family always watches the news, throw in a quick family meeting time right afterwards to recap the day. Or maybe right after supper you can do a five-minute family devotion where each family member is on rotation to share or read a devotional chapter. Or an evening walk through the neighborhood after everyone cleans up the house before bedtime in which you do Q&A time with the kids. Make it a routine and you’ll never forget to do it. Pre-supper talks. For a time, my family growing up had a stack cards which included a Bible verse and short comment that we kept on the supper table. Every evening when we sat at the table, one of us would grab a card and read it before eating. You can also buy conversation starter cards to place on the dinner table, or easily print your own. You certainly do not need to dominate your entire supper talking about a spiritual topic, but wouldn’t it be great if your family had a 60 second routine every night at the supper table to read a quick Bible verse and ask a related question while eating? Object lessons. The bible is chalked full of tangible, visible monuments of the Christian faith. There’s the Lord’s Supper, the stone monuments of Joshua, the ark of the covenant, and so many others. Visual reminders are engaging and memorable. Be creative with this one. Set a treasure chest in front of the TV in your living room and leave it there for a week; when the kids ask what that’s about, quote Matthew 13:44 and talk about the Kingdom of Heaven being like a treasure hidden in a field. Or hand all the kids a dollar bill one night, and after supper rip the bills in half and keep half for yourself. When your kids complain, just say “You can’t use half a dollar bill can you? In the same way, God cannot use half a person’s heart; He wants us to be fully devoted to Him” and then frame the bill to place on your kids’ dresser for a couple weeks. Just google Christian object lessons and you’ll have plenty of great ideas to teach your family. Most families are so busy that they are torn in all different directions during the evenings – soccer practice, PTA meetings, homework study groups, and the like. If your family is blessed to have evenings together, don’t waste them. 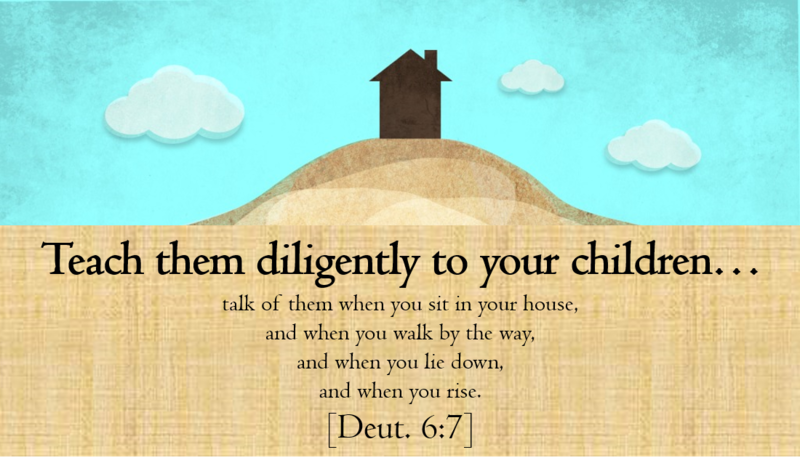 Even if your family only has one or two nights a week together, make them count and use a few moments of time to “diligently” teach your children the Christian faith (Deut. 6:7). If you have other ideas or evening routines of your own, please share in the comments section.